Mitsubishi has just launched the next-generation Outlander in India, available only with petrol powertrain option. While Indian customers are generally biased towards rugged body on frame SUVs in this segment, there are still those who prefer car-like characteristics of monocoque SUVs like the Outlander. So, here is a quick spec comparison of the new Mitsubishi Outlander with two popular unibody SUVs – the Skoda Kodiaq and Honda CR-V. The outsides of both Outlander and Kodiaq exhibit their respective manufacturer’s latest design philosophy. The CR-V we have in India, however, is a generation old product and soon to be replaced, and therefore, it does not look as contemporary as the other two. Length wise, the Outlander and Kodiaq are evenly matched because both these SUVs have an extra third row of seating. The CR-V, on the other hand, is shorter because it seats only five people. When it comes to powertrain, there sadly isn’t much flexibility in this segment. The Outlander can be only had with a 2.4-litre petrol engine, which is mated to a CVT gearbox. The Kodiq is only powered by VW group’s ubiquitous 2.0-litre diesel engine, which comes with a 7-speed dual-clutch transmission. The CR-V gets two petrol engine options with a 5-speed torque converter transmission. Therefore, you cannot have either of these cars with a manual gearbox, while CR-V is the only one to offer 2WD option. AWD is standard on Outlander, Kodiaq and on CR-V's 2.4-litre variant. If it's a well-equipped SUV that you’re looking for, then it’s the Skoda Kodiaq that offers all the luxury grade frills. Features like three-zone climate control, ambient lighting, touchscreen infotainment with Apple CarPlay and Android Auto, electric front seats with memory function, panoramic sunroof, all-around parking sensors with reversing camera, full LED, 10 colour interior ambient lighting and full LED head and tail lamps come standard on the Skoda. The Outlander and Kodiaq offer only a few of these features as standard. 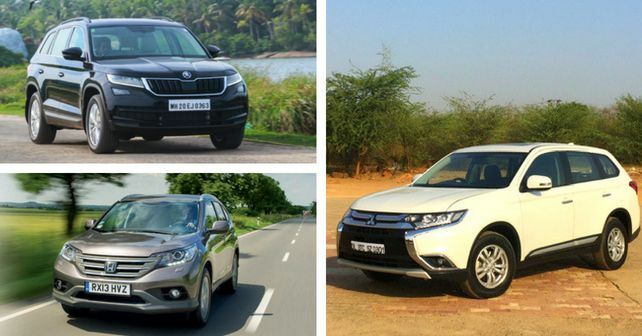 These three SUVs do not offer much in terms of variants to choose from. Both the Outlander and Kodiaq are sold in India only in a single, fully loaded trim. The CR-V, on the other hand, has two variants to choose from, but you’ll also have to compromise with power if you go with the lower-spec variant, as it is offered only with the less powerful 2.0-litre motor. Also, we must emphasise again that the current Honda CR-V is confirmed to be replaced by the end of FY’19. The new model, which was showcased at the 2018 Auto Expo, features an extra row of seating and will also very likely come with a diesel powerplant, which should make the CR-V a strong contender in this segment.